Clean, classic and graceful, the Morris Upholstered Headboard will imbue your bedroom with a calming energy. Fully upholstered in grey polyester fabric that's durable and easy to maintain, the Morris headboard is practical for emery's use. The Morris features quality hardwood and plywood for stability and strength. 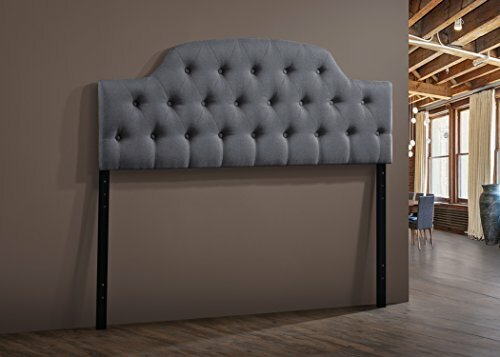 The curved shape cushioned headboard will standout in your bedroom with its button-tufted design. Supporting the headboard is the adjustable legs on two sides with pre-drilled holes built in for your preferred height matching the height of your box spring and mattress. The classic look of the Morris will work well with all of your bedding ensembles. Built in Malaysia, the headboard requires assembly. If you have any questions about this product by Wholesale Interiors, contact us by completing and submitting the form below. If you are looking for a specif part number, please include it with your message.